20 cm 480 p., 32 p. of plates : ill. Reprint. Originally published: London: Jonathan Cape, 1997. This book answers the most obvious, the most important, yet the most difficult question about human history: why history unfolded so differently on different continents. Geography and biography, not race, moulded the contrasting fates of Europeans, Asians, Native Americans, sub-Saharan Africans, and aboriginal Australians. 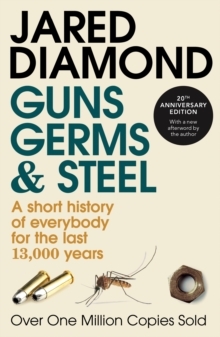 An ambitious synthesis of history, biology, ecology and linguistics, Guns, Germs and Steel is one of the most important and humane works of popular science.